Last week I was contacted by Giant Eagle. They called me pretty* and said they liked my blog and offered to let me give away five 25$ gift cards! I must admit that I felt pretty famous being asked although I know more popular bloggers get pitches all the time. I shot an email back asking what exactly I had to do and they told me it was all up to me, just tell you guys that it’s them giving away the gift cards, not me. And sorry guys, I like you, but I don’t have 125$ to drop on your groceries. So yay Giant Eagle! This is all to celebrate the grand opening of their Robinson Market District store, which looks pretty awesome. Our Giant Eagle up in Monroeville is not a Market District and what I miss most about my Shadyside store is the massive ethnic food section. We have one aisle for all of those up here and while I can mostly find what I want, I don’t nearly have the selection I used to. 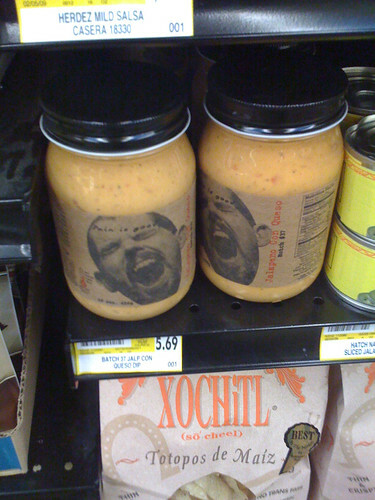 There were so many salsas I never got to try! But anyways, on the the fun part! My weakness in the grocery store is the frozen food aisle. I love to cook, but also love to be lazy. Probably because we never got to eat much from the frozen food section as kids,** there is something still wonderful to me about opening a box, turning on the microwave/oven and having dinner. Now I’m a decent cook and could probably make something way better than what I’m pulling out of a box or a bag, but one thing I can’t top is Stouffer’s Macaroni and Cheese. That is my holy grail of mac and cheese, especially if you do it in the oven and it gets a little brown on top… And now my mouth is watering. Leave a comment telling me your grocery store weakness. Aisle, item, section…the one place in the store you need to exercise extreme willpower to get through (or try and fail, I won’t judge!). One entry per person but if you want to link to this post on twitter, I’ll give you another entry, but make sure to either @ me or post the link in the comments. Contest will end…let’s say 11:59pm on Wednesday, November 11th and I’ll use some awesome random number generator to pick and post the five winners on Thursday, November 12th. * They really did. The email was addressed to qt. ** No matter how much we begged. My mom always told us she could make something better and cheaper so she did. These days I would pick my mom’s food over most anything, but as a kid I felt like I was seriously missing out not being able to microwave dinner. I can’t wait to check out the new market district when I’m home. My cousin told me it is AWESOME. oh man donuts. yesssss. i don’t like other store bakery things because i hate buttercream but yessssssss to donuts! My grocery store weakness is… the candy isle. But specifically the candy section of the ethnic food isle when there is one. I LOVE candy from the UK. i loooooove the ethnic food aisle, i want to try everything. never tried the candy though! I think I have the most trouble walking through the baking aisle. I want every cute shaped pan and all the cake makings and icing! I love making sweets! It takes a lot for me to walk past the mixes on sale! Yay I want a gift card so I can buy them without feeling so guilty! I loveeeee the cheese aisle and breads. Those are the most stressful things (well, I’ve never made cheese, but bread yes) to make on your own, and it always seems like despite how good homemade is, theres something really amazing at how bakeries can make their bread. Its ALWAYS perfect. Perfect doughy-ness (is that a word?) … Perfect crust… mmmmm. Also, Good luck with your teefs lady 😦 I have wisdom teeth busting through and I hate it. The aisle I have the most trouble walking away from in the grocery store doesn’t actually sell food. It’s the seasonal aisle that sells everything from decorations, to knick-knacks, to dishes and bowls for whatever season it may be. Giant Eagle always has such good one. And after Halloween was over, they had such great deals! I’m a sucker for a good deal! It’s a toss up between the cheese counter and junk food aisle. It takes a lot of restraint for me to not spend tons of $$$ new cheeses to try and old favorites. I also say the junk food aisle because although I try to eat fairly healthy, I have a huuuge weakness for doritos and potato chips. I try to not them at home because they tend to disappear a little toooo quickly..